Hong Kong is one of the busiest region between China and the rest of the world. Apart from meetings and conferences, it is also a top tourist destination in Asia with its coax of shopping and much of dining options. HKTDC, Hong Kong Trade and Development Council is one of the biggest trade shows in Hong Kong. The event covers the industries such as, HKTDC Hong Kong International Lighting Fair (Spring Edition), HKTDC Hong Kong Electronics Fair (Spring Edition), HKTDC International ICT Expo, HKTDC Hong Kong Houseware Fair, HKTDC Hong Kong International Home Textiles and Furnishings Fair, HKTDC Hong Kong Gifts & Premium Fair, Hong Kong International Printing & Packaging Fair, etc. Let’s talk about HKTDC International ICT Expo 2017. The innovative IT service provider company in Asia CDN Solutions Group known for its quality work and commitment is again exhibiting in HKTDC International ICT Expo 2017 to showcase the latest possibilities in technologies to increase the business profit. You can meet us at our stand in hall 3G-F28 at Hong Kong Convention and Exhibition Centre. You can also avail free e-invite to visit this mega expo. This year, we are coming in the largest ICT expo with the full list of facts and figures to upgrade your business profit. So these are some solutions we are focusing on for HKTDC International ICT Expo 2017. We will give you all pros and cons, facts and figures about the solution you need. We will provide you enhanced solutions for the challenges you are facing in business. So what are you waiting for? 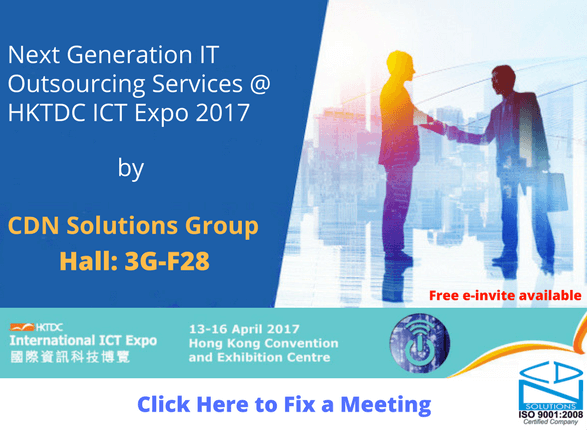 Contact us right now to meet in HKTDC International ICT Expo 2017 and get tailored solutions to upgrade your business profit.